Everything you need to properly service your BMW Cooling System... Complete kit includes only premium matched parts from European OE/OEM manufacturers. These are the same parts used and trusted by BMW, Dealerships and Technicians world-wide. Perfect Fit, Quality and Durability. This Kit Meets or Exceeds Original Equipment Specifications. Fits All BMW E46 Models Listed In Compatibility Table Above. 323Ci, 323i, 325Ci, 325i, 325Xi, 328Ci, 330Ci, 330i, 330Xi. Includes The Following Brand New Parts. 11 51 1 740 241. 11 51 1 711 481. 11 53 7 509 227. 11 53 7 509 357. 17 12 7 510 952. 11 53 1 436 408. 17 11 1 712 963. BMW Temperature & Level Sensors. BMW Expansion Tanks & Caps. BMW Cooling Hoses / Pipes. BMW Thermostats / Housings / Flanges. The item "BMW E46 Cool Kit Water Pump, Thermostat, Radiator Hoses" is in sale since Sunday, January 30, 2011. 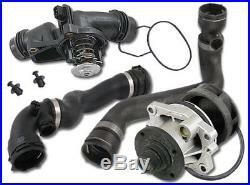 This item is in the category "eBay Motors\Parts & Accessories\Car & Truck Parts\Cooling Systems\Fans & Kits". The seller is "airfiltersandmore" and is located in Laguna Hills, California. This item can be shipped to United States, Canada.